The world is now facing a great tide of change. The trend of digital transformation cannot be stopped and is drastically changing multiple aspects of society including private lives, public administration, industrial structure and employment. While new technologies could bring about merits such as higher standards of living and better convenience, they could have negative effects such as impact on employment, growing disparity and maldistribution of wealth and information. It is up to us to choose which direction to go. We must consider what kind of society we wish to create rather than trying to foresee the kind of society it will be. Therefore, Japan will take the initiative in guiding the world to a brighter future by demonstrating an ideal concept of the next society, named as Society 5.0. 1 In the proposal, Keidanren has redefined Society 5.0 as "Imagination Society". People are expected to exercise their rich imaginations to identify a variety of needs and challenges scattered throughout society and scenarios to solve them, as well as creativity to realize such solutions making use of digital technologies and data. Society 5.0 will be an Imagination Society, where digital transformation combines with the imagination and creativity of diverse people to bring about "problem solving" and "value creation" that lead us to sustainable development. It is a concept that can contribute to the achievement of the Sustainable Development Goals (SDGs) adopted by the United Nations. 1The 5th stage of human society following Hunting, Agrarian, Industrial and Information Societies. It was officially presented for the first time in the 5th Science and Technology Basic Plan in January 2016. It is a concept that can contribute to the achievement of the Sustainable Development Goals (SDGs) adopted by the United Nations. 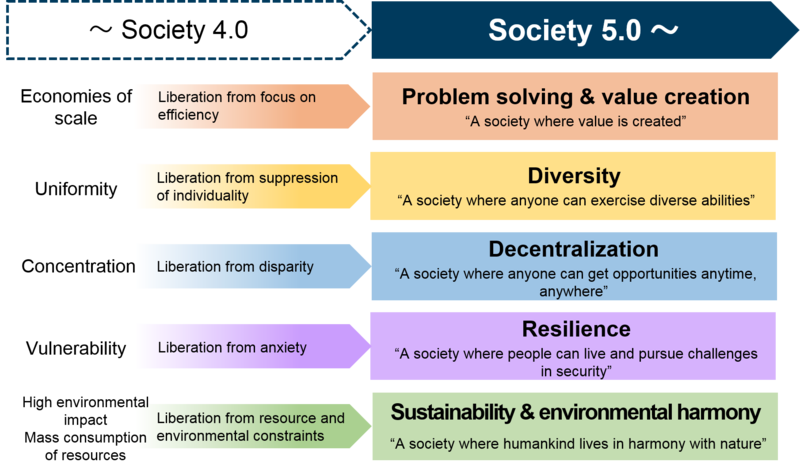 In Society 5.0, people will be liberated from various constraints that could not have been overcome up to Society 4.0 and will obtain the freedom to pursue diverse lifestyles and values. In short, we will make Society 5.0 a society in which anyone can create values anytime, anywhere, with security and in harmony with nature. In Keidanren’s proposal, Keidanren has described specific images of Society 5.0 picking up some of the most important areas including smart cities, energy, disaster response, healthcare, agriculture, logistics, manufacturing and services, finance and public services. Keidanren is working together with the government and other stakeholders on corporate and labor policy reform, human resource development, establishment of data policy, enhancement of research and development, governmental reform, etc. for the realization of Society 5.0. We wish to share the goal with our partners in the world and co-create the future. Hiroaki Nakanishi is Chairman of KEIDANREN, Chairman of Keizai Koho Center and Executive Chairman of Hitachi Ltd.
KEIDANREN (Japan Business Federation) is a comprehensive economic organization with a membership comprised of 1,376 representative companies of Japan, 109 nationwide industrial associations and 47 regional economic organizations (as of May 31, 2018). Keizai Koho Center (Japan Institute for Social and Economic Affairs, KKC) is an affiliated organization of Keidanren.KKC serves a bridge for the Japanese business community to interact with its key stakeholders inside and outside Japan. The is a forum to discuss new developments, changes,and challenges of Japan and the international society.